The Western Reserve Building Trades Council represents skilled craftsmen that have been building quality structures on time and on or under budget in the Mahoning Valley for over 100 years. Comprised of over 21 local unions and district councils, the WRBCTC serves Columbiana, Mahoning, and Trumbull counties. The valley’s preeminent construction professionals have continuously shown project owners the benefits of using skilled labor by producing the highest quality results, which create exceptional value. Both apprentice and journeyman receive world-class instruction at state-of-the-art training centers, which not only help them hone and upgrade their skills, but also allow them to work safely. 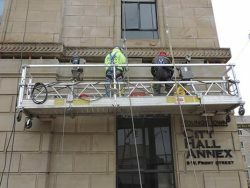 Local 8 Bricklayers doing masonry restoration work on the Youngstown City Hall Annex. WRBCTC President Rocco DiGennaro Jr., his Executive Board, and local business managers and representatives work closely with the area’s signatory contractors to not only ensure they have the manpower for any size of job, but also work to ensure the success of the collective bargaining process.